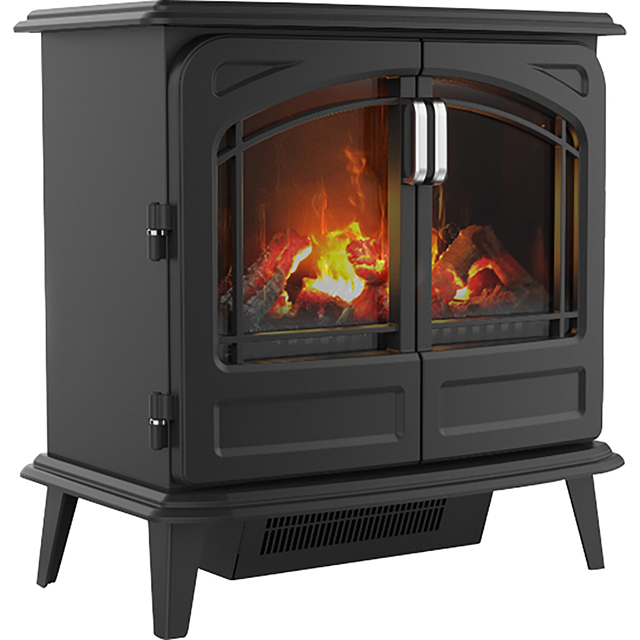 Transport yourself to a cosy log cabin with this electric stove from Dimplex. Clever Opti-myst® technology uses ultra-fine water vapour to create stunningly realistic flames and smoke – so you can enjoy the feel of a roaring fire. It has a realistic log effect fuel bed too, to complete the illusion of logs crackling away. With its 2000 Watt power output, it heats up in no time when there’s a chill in the air. The flame only setting is great for warmer days as well, as you can enjoy the flickering flames without creating extra heat. This model has a safety shut off system for peace of mind too, so you’ll never have to worry if you leave it running accidentally. It looks really good in the matt black and adds warmth to house even without the heat on. Water tank gets topped up everyday, tho its not empty. Its on for about 6 hours a night. Good heat on low or high power. Can choose between just the fire effect or fire and heat. Fan heater is not that noticable if you have background sounds on like tv etc. Its as close as you can get to a real fire. A lovely realistic fire that all our visitors comment on - they can’t believe it’s not real ! A nice fire without the hassle of chopping wood and cleaning grates out every morning.